Despite now being in his mid-50s, Tom Cruise is showing no signs of stopping when it comes to physical action roles! After the recent disappointment of last year's horror reboot The Mummy, Cruise is continuing to defy his critics as he reprises the role of heroic spy Ethan Hunt in yet another Mission: Impossible outing. The sixth film of the series, entitled Mission: Impossible - Fallout, premiered its official trailer at the Super Bowl last night and features a variety of even more jaw- dropping stunts! Is there anything Cruise won't do for a shot? Directed again by Christopher McQuarrie (Jack Reacher, Mission: Impossible - Rogue Nation), the little-known plot sees Ethan and his IMF team face a race against time to clear their names after a mission goes wrong. 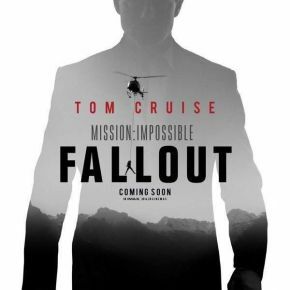 Cruise is joined in the film by other Mission: Impossible series regulars which include Rebecca Ferguson (Ilsa Faust), Simon Pegg (Benji Dunn), Ving Rhames (Luther Stickell), Michelle Monaghan (Julia), Sean Harris (Solomon Lane) and Alec Baldwin (Alan Hunley). Fresh from donning the red cape as Superman, British actor Henry Cavill (Batman v Superman: Dawn of Justice, The Man from U.N.C.L.E) is the high-profile addition to the series as he plays a mysterious character who goes up against Hunt in the trailer. There are also debuts for two talented actresses in the experienced Angela Bassett (What's Love Got To Do With It?, Black Panther) and the lovely Vanessa Kirby who has recently concluded her role as Princess Margaret in the hit Netflix series The Crown. Production on the film was delayed for two months after Cruise suffered a broken ankle during a stunt, which can be seen in the footage. Mission: Impossible - Fallout will be released in the UK on July 27th 2018.